Saturday May 9 1908 Hattie is 51 years old today. The weather is warmer I was busy with baking and the care of the chickens all forenoon. Ed [Kover?] was here to measure for our new porch. I went down to Woolfs in afternoon Will and I put all the chickens in the little yard tonight. Sunday May 10 1908 A fine morning I got my work done and went to church. Mrs [Hensler?] went with me. I came home to get the dinner. Ida Vaughn was here in afternoon. Mr Art Jones was here looking over the farm We may sell the north end of it. I did the work and went down to Coralville to church in the evening. Monday May 11 1908 I got my work down and a nice dinner going. Ann [Hensler?] came out at 10.29. 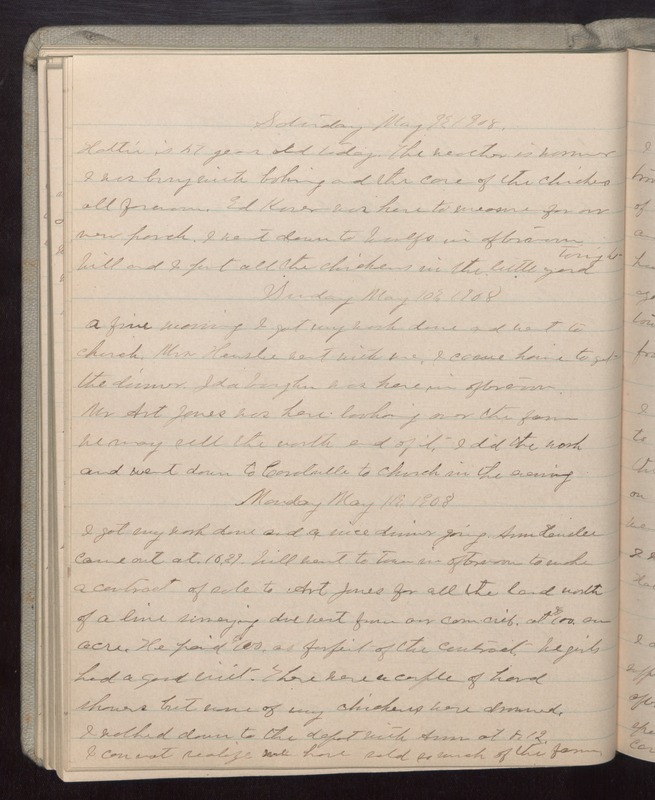 Will went to town in afternoon to make a contract of sale to Art Jones for all the land north of a line [illegible] due west from our corn crib at $100. an acre. He paid $100 as forfeit of the contract. We girls had a good visit. There were a couple of hard showers but none of my chickens were drowned. I walked down to the depot with Ann at 8.12. I cannot realize we have sold so much of the farm.